A Frugal Family's Journey: We Just Joined the 500K Club!! We Just Joined the 500K Club!! We started blogging about our frugal family's journey roughly 38 months ago, on March 15, 2014. 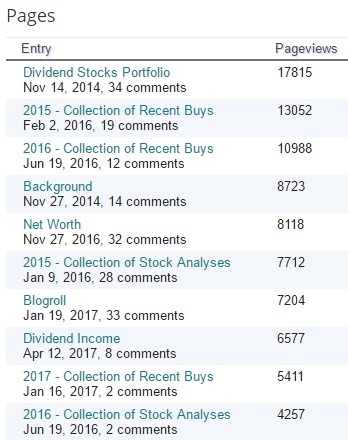 Our blogging journey started out as a hobby and simply a way to keep on track of our progress. Flash forward 3 years and roughly 2 months later, I am thrilled to announce that because of each and every one of our readers, we just reached yet another milestone. As of yesterday, May 19, 2017, we became proud members of the 500K club! It took approximately 15 months to reach our first milestone of 100,000 page visits to our blog. The second milestone of 200,000 page visits took 6 months and 28 days. 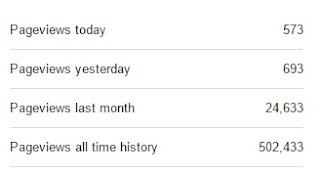 Our next milestone of 300,000 page visits, even with a 6-week hiatus last summer, took us 7 months. Our last milestone of 400,00 page visits then took 4 months and 22 days. We did that on February 2, 2017. And thanks to all of you, our progress steadily continues to increase at a faster pace. I'm happy and blessed to say that we reached the 500,000 page milestone yesterday, in just 3 months and 17 days! Also, thanks to all that have tweeted or re-tweeted our posts. Our additional presence and our followers on Twitter continues to help get our blog grow. In case you would like to follow us on Twitter, we can be found under: @FrugalFamilyof4. I'm proud to say that we now have 1,666 followers on Twitter. That is 191 new followers since our last milestone post on February 2nd. Our top three most popular page visits are: 1) Dividend Stocks Portfolio with 17,815 page views; 2) 2015 - Collection of Recent Buys with 13,052 page views; and 3) 2016 - Collection of Recent Buys with 10,988 page views. It is great to see that our readers are utilizing our free reference tools. We will continue to do our best to continue to maintain both collections to ensure they remain current and popular. 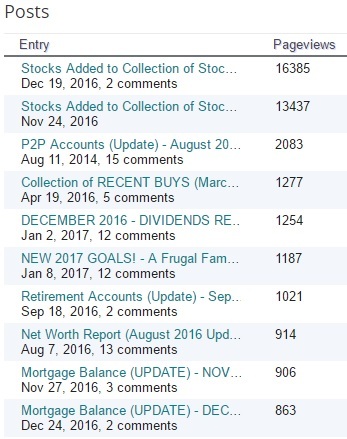 Our top three most popular posts are: 1) Stocks Added to Collection of Stock Analyses - December 2016 with 16,385 page views; 2) Stocks Added to Collection of Stock Analyses - November 2016 with 13,437 page views; and 3) P2P Accounts (Update) - August 2014 with 2,083 page views. It appears that readers value the UPDATES to our Collection to Stock Analyses more than the actual collection itself. Seeing these results, we will certainly make sure to provide updates more frequently. 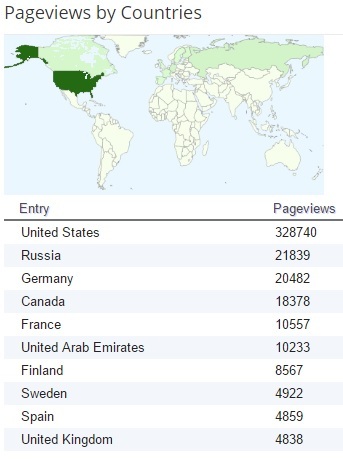 We are tremendously grateful that our blog has seemed to have a worldwide presence as evident by the chart above. However, the top page views to our blog came from the following top three countries: 1) United States, with the largest presence at 328,740 page views; 2) Russia in second with 21,839 page views; and 3) Germany in third with 20,482 page views. The top four has remained unchanged since our last milestone post. wow fantastic! great work. Im curious what you use to analyze the site so good. Is that google analytic s? Its crazy the internet is a fun place to be. It helps keeps me motivated and surprises me with all the views and how worldwide you can become. Good job. Of course I've been on your page about 10 times lol. Awesome. It's great to see the gap shrinking. 600k is only a month or two away. Great job reaching your milestone. 500k page views is very impressive. Fantastic, AFFJ! Very impressive and accelerating page view count! 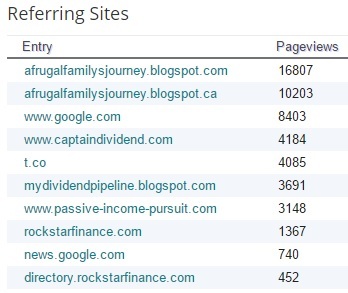 I'm seeing similar acceleration in my page views, and Captain Dividend is one of my top referring sites, too. I wonder how he does it? Take care and onwards to 1,000,000!